Promotional spot says couple will announce "life-changing decisions"
(CNN) -- With ratings sagging for TLC's "Jon & Kate Plus 8," the cable channel is teasing viewers with the revelation that "Jon & Kate have an announcement." Jon and Kate Gosselin's show on TLC had record ratings last month as they dealt with marital problems. The reality show's regularly scheduled episode will be pre-empted by a one-hour "special" Monday night, according to a TLC promotional spot released Thursday. 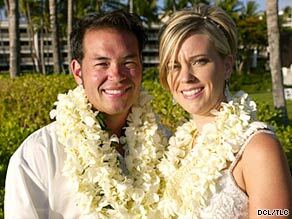 "Recently, we've made some life-changing decisions, decisions that will affect every member of our family, ones that we hope will bring each of us some peace," Kate Gosselin says in the video promo. The season opened amid tabloid reports accusing Jon of cheating with a 23-year-old, which Kate said she did not believe. "We, as you know, have a reality show. Everyone wants to know everything about us," she told CNN's Larry King last month. "And I feel like this is a situation, you know, you can't believe everything that you read ... and so we are dealing with it privately." Blog: Is what's happening to 'Jon & Kate' fair? Jon Gosselin issued a written statement last month saying the "allegations are false and just plain hurtful." "The bottom line is, I did not cheat on Kate," he said. "I'm sorry for putting my family in this awkward position, given some poor decisions and bad judgments I've made recently." The poor judgments stem from the fact that Jon does not understand the full impact of being a public figure, Kate Gosselin said. "Jon is having difficult times realizing that you can't go to the grocery store without people whipping out their cell phones, calling everyone they know and taking pictures of you," she said. "He is dealing very poorly with it ... and these things are making him realize, 'Oh, my gosh, I cannot go anywhere without everyone knowing who I am.' "
The couple married in 1999 after meeting at a picnic in 1997, according to their Web site. Kate said they are committed to their family. "I think the important thing to remember is that we love our kids to pieces," she said.